The Tensions in Exorcism Cinema project began in 2013, when my partner Christopher J. Olson (Seems Obvious to Me) and I watched the film The Possession and noted how common it seemed for women to be the victim of possession who needed to be saved through exorcism. We wondered, is that true of all exorcism films? So we started researching these films and watching as many as we could get our hands on. While not every film focused on women as the possessed threat, the majority did, and those that didn’t featured a possessed person of other minority groups, such as people of color or the nonheteronormative. Realizing this pattern, we wrote a book, and now it is coming out from Lexington Books, a subsidiary of Rowman and Littlefield, called Possessed Women, Haunted States: Cultural Tensions in Exorcism Cinema. The book has been published this month (November 2016) and you can order it now directly from the publisher or from your favorite online retailer (such as Amazon and Barnes and Noble). You can also follow the book on Goodreads, where you can enter to win a free copy. The giveaway runs from November 16-23. Follow this link or use the widget below to enter! Since the release of The Exorcist in 1973, there has been a surge of movies depicting young women becoming possessed by a demonic force that only male religious figures can exorcise, thereby saving the women from eventual damnation. This book considers the history of exorcism cinema by analyzing how the traditional exorcism narrative established in The Exorcist recurs across the exorcism subgenre, with only the rare film deviating from this structure. 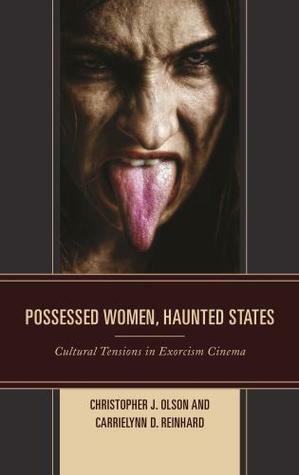 The analysis presented in this book uses various cultural and critical theories to examine how depictions of possession and exorcism reflect, reinforce or challenge prevailing social, cultural, and historical views of women, minorities, and homosexuals. In particular, exorcism films appear to explore tensions or fears regarding empowered and sexually active women, and frequently reinforce the belief that such individuals must be subjugated and disempowered so that they no longer pose a threat to themselves or those around them. Even more recent films produced after the emergence of third wave feminism typically reflect this concern about women. In fact, exorcism films very rarely present empowered women and feminine sexuality as nonthreatening. In examining the exorcism subgenre, this book looks at films that have received little to no critical scrutiny regarding how they relate to and comment on the historical periods in which they were initially produced and received. Given the results of this analysis, this book reveals the necessity of examining how possession and exorcism are portrayed onscreen and elsewhere in popular culture. And here are some advance reviews of the book. Christopher and I are extremely proud of this book (not to mention humbled by these gushing reviews), and we believe it represents an important contribution to the area of film studies by examining a subgenre of horror cinema that has received little scholarly attention. We hope you find this book both interesting and useful as it helps you think about films that depict possession and exorcism. NOTE: We just got our print copies, and Christopher found a mistake. On p. 13, the wrong word is used in discussing queer theory. The sentence “Queer theorists challenge the idea of homosexuality as a biological necessity…” should read “Queer theorists challenge the idea of heterosexuality as a biological necessity…” Our apologies for the incorrect word; somehow during the revising process things got switched, and we wanted to make certain it was clearly stated here the tenets of queer theory.